When you sign up for Google Voice you get a new phone number that works as a virtual switchboard for all of your incoming calls, whether they’re going to your work phone, home phone, or cell phone. Making and receiving calls with Google Voice is easy, but setting the service up requires a bit of time and commitment. 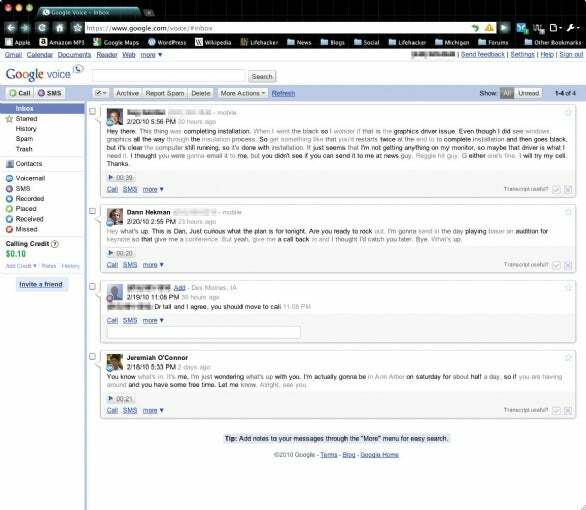 The Google Voice Web interface will look familiar to Gmail users. You’ll see Inbox, Starred, History, Spam, and Trash sections above a contact list. From the main screen you can view and organize your voicemails and SMS messages, as well as send texts messages and make calls. Customization options for Google Voice are available through the Settings menu in the upper-right hand corner of the Web interface. This is where you organize contacts, set-up call forwarding, and configure your voicemail and SMS preferences. Your text messages and transcribed voicemails are stored in your Google Voice inbox, where they are organized with advanced searching, archiving, starring and filtering options. You can respond to each text directly from the Web interface and Google will save all of your conversations, so there’s no more deleting voicemail and texts when your phone’s memory is full. Google’s voicemail transcribing is an incredibly useful, if amusingly imperfect, feature. When Google is less certain about what it has transcribed, those words appear in a light gray. Words it thinks are correct appear bolded. Even with a few words off, you can instantly see what a person what trying to say at a glance without wasting time waiting for them to get to the point on a long rambling voicemail. Google Voice does its best to transcribe incoming voicemails so you can see and organize them in your online Inbox. It’s possible to make outgoing calls directly from the Web interface, but since Google Voice is not a VOIP service like Skype you must take extra step: Google Voice calls your phone and connects you to your desired contact once you pick up. Your first task once you have a number is to collect your contact information. Since Google Voice uses your Gmail contacts, be sure to sync your Mac’s address book with Google to keep your contacts the same across platforms. To do this, open up Address Book (in /Applications), select Address Book -> Preferences, click the General tab, and then select the Synchronize With Google option. You’ll want to create groups in your Google contact list to make managing the barrage of incoming calls and texts easier. You might start with one for work, one for friends and family, and one for people you’d prefer not to talk to. Each phone call you make or receive will create a new Google contact that you can then add to a group. Training all of your contacts to start calling one new number can be tricky, as anyone who’s ever changed e-mail addresses knows. Send out e-mails and texts informing everyone of your new number, and commit to only calling people back from your new Google number. Change outgoing messages on your old phones to inform people of your new number and avoid answering calls to those numbers. If you want to keep your phone numbers instead of getting all new digits, you can still use Google Voice’s advanced voicemail and text by forwarding all unanswered calls to Google Voice. (There are carrier-specific directions in Google Voice’s settings section, under Phones.) You can also do this if you have a Google Voice number but aren’t using a smartphone—that way, even if people call your non-Google number, all your voicemail is still in one place. Your next step will be setting up rules. Add your phones to Google Voice under the Phones tab in Settings. In the Groups section of Google Voice’s settings, you can instruct Google Voice to forward incoming calls and text messages to all of your other numbers at once, or just specific people to certain phones using rules like Time Of Day or Contact Group. To specify rules for a group, go to Groups under Settings and click Edit. This is where you can record custom greetings and set your default greeting. Your work contacts will hear a professional “away” message, and friends and family can hear a more casual message. There is no limit to the number of greetings you can record. You can also set up Google Voice to forward voicemails and SMS messages to your Gmail account and your mobile phone via text message. Replying to these e-mail or text messages will send your message an SMS from your Google number. If you don’t like to keep Web applications open in tabs, you can opt to run Voice through a site-specific browser using Fluid for Mac. Once you do that, in addition to keeping Google Voice open, you can also get Growl notifications and dock badge icons with the help of a browser script such as Google Voice Growler/Badger for Fluid. If you’d prefer not to have another app eating up RAM, there are also third and first party extensions for Mozilla Firefox and Google Chrome that will keep you notified of new SMS messages, voicemails, and missed calls. If you use many Google Apps, you might be interested in One Number, a Chrome extension that checks and gives you quick access to everything from Google Voice to Gmail. If you’re looking for a dedicated app, there are a few third-party Google Voice clients for Mac, the best of which is a dashboard widget called GV Connect. It allows you to send SMS messages and make calls to your contacts in Google or Address Book. If you have Growl installed, you can also receive Growl notifications for SMS messages and missed calls. You can’t view your inbox in the widget itself, but it does provide a shortcut to the Web interface. Apple’s App Store rejected an office Google Voice app, so the iPhone does not have a native app like its other smartphone counterparts. However, Google has created a slick iPhone-friendly Web app that lets you make calls, view voicemail, and send SMS messages right from mobile Safari. On your iPhone, direct your browser to http://m.google.com/voice and log in.